ATLANTIC CITY, N.J. -- Atlantic City's most spectacular casino flop is getting another chance under new ownership and a new name. Colorado developer Bruce Deifik said Monday he had purchased Atlantic City's former Revel casino hotel from Florida businessman Glenn Straub for $200 million. He plans to reopen it this summer, around the same time the former Trump Taj Mahal casino will reopen nearby under the Hard Rock brand. 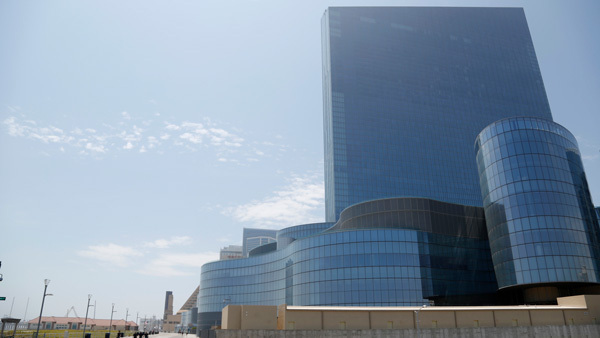 The former Revel will be called the Ocean Resort Casino. Deifik called the purchase "a dream come true." But the news raises a sobering question for a gambling resort that only recently regained its equilibrium following the shutdown of five of its 12 casinos: Might the sudden reintroduction of two large casinos create the same conditions that led to the wave of shutdowns in the first place? Revel's sale was finalized Thursday afternoon, during a blizzard, a fitting development for a project with a turbulent history. It cost $2.4 billion to build, yet lasted just over two years before shutting down, never having come close to turning a profit. "We are incredibly excited that we were able to take advantage of the opportunity to acquire this tremendous property at a time when Atlantic City is seeing great economic strides," he said. "The former Revel property opened at a time when Atlantic City was still in economic recovery, and operationally it just did not cater to the customer base for this destination." One new amenity Deifik plans is a sports book facility that would operate if New Jersey wins its U.S. Supreme Court case to legalize sports betting. He said the casino will employ 2,500 to 3,000 people. It has 1,399 hotel rooms. The gambling area will offer 100 table games and 2,200 slot machines. Deifik said he plans to bring back some of the restaurants that were popular at Revel, along with some new ones, including an Asian noodle bar. He also plans a high-end players' club. Deifik is president and CEO of Integrated Properties Inc., which owns 103 commercial properties in five states, including the Hyatt Grand Champions Resort in Palm Springs, California, and several office and retail centers in the Denver and Phoenix areas. Analysts are mixed on whether Atlantic City's seven operating casinos can handle two more competitors. Some say the reopenings could hurt smaller casinos and possibly lead one or more to close, but others are optimistic the new offerings - particularly the music-themed, globally known Hard Rock brand - can bring new customers who otherwise would not have traveled to Atlantic City. Revel opened in 2012, with no less an aim than to rewrite the rules of success in Atlantic City's casino market. It eschewed bus-riding, buffet-patronizing day trippers in favor of a hoped-for clientele of Wall Street traders, hedge fund execs and the highest of high-rollers. It was the only Atlantic City to ban smoking. The $13 million in casino winnings it took in its first month ranked it near the bottom of Atlantic City's 12 casinos - a spot it would occupy for its two-year existence. It went bankrupt twice, choking on massive debt it couldn't come close to paying, and closed on Sept. 2, 2014. Straub, a Polo-loving multimillionaire, bought it for $82 million from bankruptcy court and then fought with state officials over whether he needed a casino license. He said Monday he bought Revel "to keep and not to sell." But he quickly tangled with government regulations at the local and state levels that he said frustrated his plans to spend hundreds of millions of dollars to help redevelop Atlantic City. Straub sold the property for $118 million more than he paid for it, but he incurred large expenses while keeping it closed. But what Straub described as burdensome red tape are rules that all Atlantic City's other casino owners comply with. And a significant portion of his expenses involved legal fees incurred in fighting government regulations with which he disagreed. Straub said he retains more than 60 Atlantic City properties, with which he plans to "be a spark for catalyzing positive economic movement in Atlantic City." The closest he got to reopening Revel came with the partial installation of a rope-climbing course in what used to be the casino's port cochere area. But even that modest venture failed and was ripped out while half-finished. Before settling on a reopened casino and hotel, Straub floated a wide variety of proposed uses for the property. They included a water park; condominiums; a health-themed spa; an equestrian facility; a so-called "tower of geniuses" where the world's top minds would gather to tackle society's problems, and a temporary home for Syrian refugees.